To get ready for today, we recently re-watched The Last Jedi, and when we had to decide who or what to put on our 2018 May the Fourth be with You Party Shirt, the choice was easy… a Porg! Quick note, I made him a little differently from the designs in years past. I never had the iron-on colors touch in the other designs, but the Porg looked so much cuter without the black lines between each color I just didn’t have the heart to add them. I have not yet tried doing an iron-on with colors that touch, so if you try it, please let me know how it works out. For our new friends who have not seen our other M4P silkscreen pattern, scroll down to take a look at a few, and find links to all of them! As always, we ask you not to make and sell these. A, because LucasFilm Ltd. and Disney owns the rights to all characters, and B, because we made the designs and it would be unfair for you to make money off them. We also we want to remind you that we should get credit when the patterns are used. So, if you show your work using our designs anywhere (online as well), put a “Pattern © Anette Nam Design” and link to “Maythefourthbewithyouparty.com” (or this page) somewhere close by. THANK YOU! Load and convert the pdf file on computer, and reverse the image. ← Is Star Wars: The Last Jedi OK for Kids? So cute!! 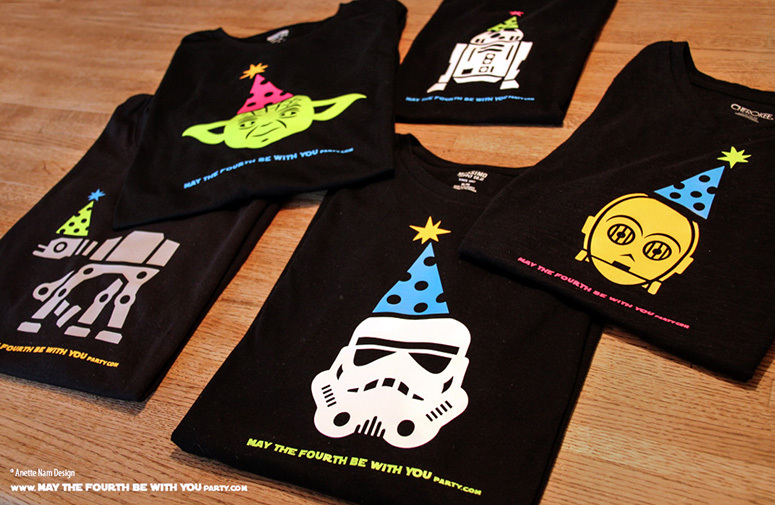 Hope you had an awesome May 4th! Thank you! We did have an awesome May the Fourth! Since you liked the Porg, you will be the first to know what we had for dinner… Roasted Porg!!!!! (I know, terrible!) I’ll post the recipe soon 🙂 I hope you had a great day as well!! !